Nature-Based Outdoor Education Camps for Schools and Corporates. Inspired by these words of Swami Vivekananda we have developed “outward bound school or outdoor education camps” with the target to introduce adventure based development program for the students of schools, colleges & management institutions whereby an individual’s personality can be enhanced with the virtuousness of nature. Successful adventure activity requires principles of leadership, planning, teamwork & motivation. These qualities have also been found to be very necessary to reach the top of one’s own profession, may it be business, education administration. Such personality traits can be developed by using adventure activities as part of the education program or curriculum. The ‘outward bound school’ is the best and most effective means of achieving the above objective through activities which are thoroughly enjoyable, educative and enriching both mentally and physically. By experiencing nature and adventure in the lap of the Himalayas one can realize the feeling of oneness with the natural surrounding and respect holistic existence of humans. Side by side the entire experience develops leadership quality, team spirit, mental and physical endurance and boosts self-confidence to face the reality of life and become happy, healthy, prosperous and confident to take any challenge life has to offer. Samsing Chauthary is an NGO based in the sub-Himalayan belt of West Bengal which is aptly defined as ‘door of eastern Himalayas’ and as an ‘adventurer and nature’s paradise’. Being an organization with different profiles based on the social, environmental and economic uplift of society we have a complete team of experts that also include mountaineers, where our main goal is to promote, develop & flourish nature-based study and rural tourism in the region and to bring adventure-based education at easy reach for all. Our Team is, in fact, is the only organization in the region having the expertise and platform for learning through adventure activities. It welcomes participants of different sectors wholeheartedly and is proud of an efficient and strong manpower comprising of experienced, qualified and famous individuals in this field at the national level. This way we intend to extend this treasure to the outdoor lovers across the globe. All these qualities lead to the overall development of an individual into an able and successful human being. So, whether a student of a school or an adult working in a corporate sector, all can draw the benefits of outdoor education camps. This nature-based outdoor education camps’ location will be either within the Dooars region,Darjeeling hills of North Bengal or the state of Sikkim and will be chosen in such a way that it provides a treat of nature’s beauty to the campers and also has an ambient atmosphere for inculcating the above-stated qualities and developing a person with a strong personality. They will also enjoy the heritage of rich flora and fauna of the Himalayas. The outdoor education camps cover trekking, water activities, rock climbing, rappelling and yoga & meditation. All the participants will have the rare experience of getting glimpses of majestic Himalaya and its rich flora and fauna. Lecture on Rescue operation Hazards on a mountain Trek sign, Himalayas mountain terminology etc. 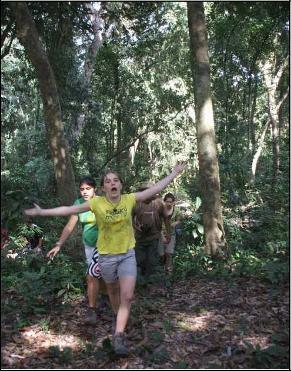 Full four days and three nights of adventure will be in store for the campers to imbibe the benefits of the activity. Besides the monsoon season (Late June to early September) any time of the year is suitable for camping. Extensive and painstaking preparations are undertaken into the planning of the camp for the safety of the campers. The experienced field staff, instructors and camp officials keep a constant vigil on YOU for your wellbeing.